The general theme of my project was the botanical phenomenon of “Anemophily” (Greek: wind–love), a botanical term describing the reproduction process whereby trees and plants harness the wind to spread their seeds. The project consisted of a photo series and a 16mm film showing the spread of poplar seeds, shot in different Berlin parks. The white seeds, like snowflakes in texture, are released from the tree’s catkins as spring turns into summer. The flakes fill the air, covering the streets with a white blanket. The 16mm film piece, which has a duration of 6:32 min., is an alternation between lyrical scenes of the natural world and scenes of a young man masturbating in a forest. A rising dramaturgy gradually builds, reinforced and enhanced by a symphonic piece of music. The culminating scene shows a release and physical ecstasy, with heavy gusts of flying seeds crosscut with close-ups of the young man’s face as he reaches his sexual climax. In 2014, the film was exhibited as an installation tableau presented in the neo-classical pavilion of the exhibition space Lynx in Oslo. In conjunction with the film, I created a tableau consisting of branches from trees and leaves with ripe catkins from the poplar tree, collected in Berlin. 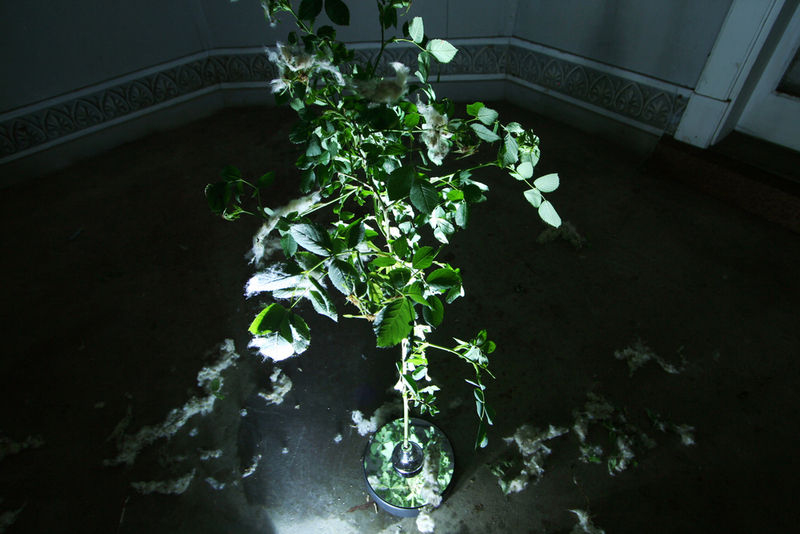 The branches as well as the poplar seeds were set in motion in the gallery space, reproducing the movement of the video in the physical space of the gallery.